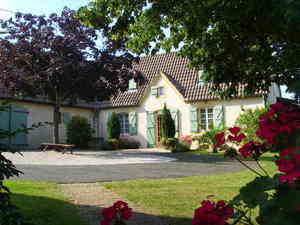 In the heart of "Vic Bilh" considered for its wines and its gastronomy, Maryvonne and André accomodate you in their authentic house built in the 18th century named "Le Bidou". "Le Bidou" holds for you calms, relaxation and expatriation within a framework of nature, cordial and convivial! To define it, the owner of that kind of lodging likes receiving people in his own house, like a friend would do. He'll try to give to your stay a special taste of expatriation, far away from the noises of the city and the stress of modern life. You will not be a number in a bedroom, but a visitor able to share the French way of life, in a convivial climat. If you come from National road #134 (now 834), take Garlin on your right then follow Lembeye’s direction on D16 until Tadousse. At that point, take D143 until Vialer. If you’re on the road D13 between Aire/l’Adour and Lembeye, when arrived at Cadillon, take on your right towards St Jean Poudge’s direction until the road D143. If you’re on the D943 from Pau to Lembeye, pass Simacourbe, then turn on your left direction Lespielle-Gayon until Vialer.